Managing a holiday can be very hectic as there are lots of expectations of everyone related to the holidays. This is a tool which helps you in managing all the invitations which you have sent to the people for holidays. While managing a holiday invitation, it is very important to stay organized. Without a holiday invitation manager, it can be very difficult for you to track the number of people who are going to attend the holidays. Let this manager help you and make your life easier. Managing the holiday invitation is no more complicated. Start the manager by entering the day name and date of the holiday. After that, enter the names of all the guests in the column, which has to keep the record of all the guests. After writing the names of the guests, you are required to write all other information in the manager. Once you will write all the details in it, the manager will automatically calculate the number of people whom you have invited and also the people who will be coming for the holidays. It gives you everything that you may need to have on one page. 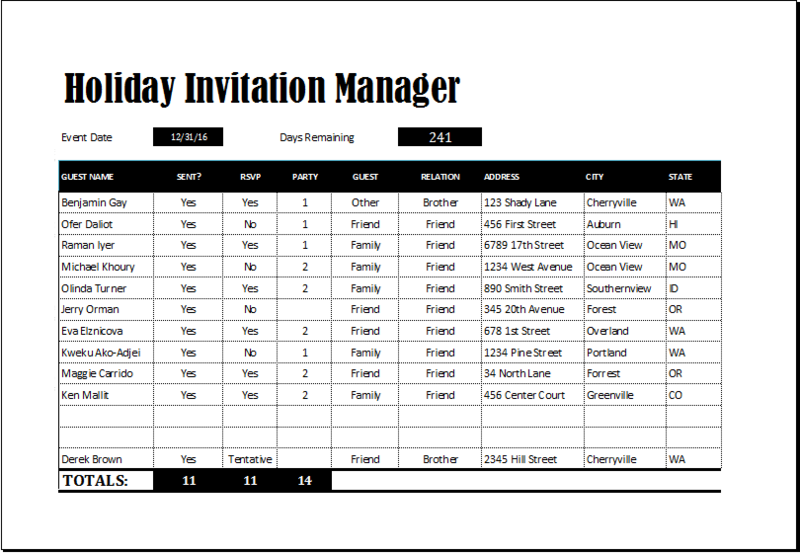 This holiday invitation manager can be easily customized according to your needs. It also saves a lot of time of yours. It gives you an opportunity of managing your holidays rather wasting your time in managing the list of guests who has been responded to your message and are coming at your event.